In the interest of full disclosure, I have to admit I am not a sports afficionado in general or a baseball fan in particular. This is despite the fact that my great grandfather, Tom Smith, was a professional baseball player. It’s hard to be indifferent, though, when the Red Sox are in the World Series and the world as we know it in Boston is aflame with Red Sox fever. 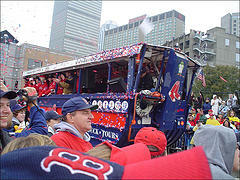 There is no public discourse possible without contemplation of another World Series victory and another triumphant parade through the streets of Boston. There will be no rest for the Red Sox fan in the coming week – especially with games to be played in a different time zone. Workplace productivity will give way to recovery from the prior evening’s contest and speculation about what will happen next. Even though I don’t fully appreciate the depth of the passion, I think I understand the source. Baseball is the perfect metaphor for what most of us wish the world of work could be. The rules are clear – you hit the ball, you run the bases. If you make it home, you score. The adversary is clear, and teamwork is critical to victory. In fact, only the team can win. For most of us, life at work is nowhere near this definitive. The goals change, the rules change, and victory isn’t always forthcoming – even with extra innings. Competition isn’t always focused outward. And even when you make the perfect play, there aren’t generally fans in the bleachers to shower you with appreciation. So, I’ll watch the game tonight and every night during the series. Just like everybody else in Red Sox nation, I want to share the feeling of a job not only well done, but well appreciated. Watching the rookie Dustin Pedroia is worth staying up by itself. And to reiterate what you said Joyce, it does take teamwork to win and hopefully my team at work will all be in a haze most mornings cause we all stayed up watching the Sox.